The scenario is that “the Lotus Notes users are frequently receiving the ‘winmail.dat’ attachments.” These attachment files appear like binary files without any special formatting added by the sender and are inaccessible to the users. Later, the Notes users find out that the sender is Exchange Server. We have tried some manual solutions to fix this issue. Why this Winmail.dat attachments issue? 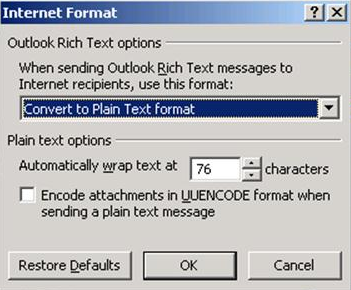 This attachment issue basically arises when the Exchange Server sends a message without turning ON the MIME encoding and has adopted the proprietary of Rich Text Format (RTF). Lotus Notes application does not support messages in Rich Text Format in its older versions, although the latest one like Domino 8.5x supports the RTF format. You can either try finding the solution through Domino Administrator or through changing RTF formatting in different versions of Exchange Server. First, install the latest updates for Domino (versions 6.5.6, 7.0.3, 8.0.2, or 8.5.x). Open your Domino Administrator. Navigate to SERVER>SERVER CONSOLE. Then run these commands one after another. Launch the Exchange Server Manager. 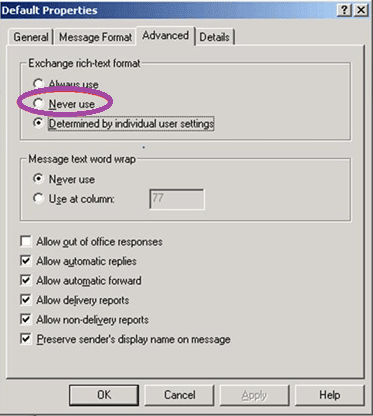 Go to Global Settings in the Exchange System Manager, and then select Internet Message Formats and then click Standard. In the context menu, select Properties and click on the Advanced tab. Now under the heading "Exchange rich-text format" select 'Never Use' option and click on OK.
Open the Exchange Management Console. Then under Open Organization Configuration, select Hub Transport. Click on Remote Domains, then right click on Default Domain option and select Properties. Click on Format of original message sent as attachment to journal report option and click on the Message Format tab. Now within the Exchange rich-text format section at the bottom, select Never use and click on Apply. In Exchange Management Shell, run the following command to list the domains with RTF (TNEF) encoding. Disable sending messages in RTF domain by running this command. After executing the commands, you need to restart the Microsoft Exchange Transport Service to confirm the changes. All these RTF formatting settings would resolve the WinMail.dat attachment issues in non-Exchange based email clients like Lotus Notes. And if you find many restrictions or limitations in your current Lotus Notes email client, you can anytime migrate its data to any version of Exchange Server with Kernel for Lotus Notes to Outlook tool. The software has the simplest user-interface and performs automated migration in no time. Feel free to migrate anytime with secure software.